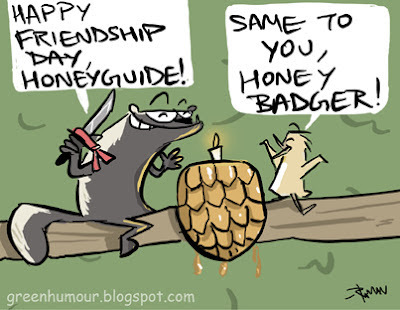 One great example of friendship among animals is between the Honey badger and the Honeyguide. The Honeyguide leads the badger to a bee hive. The badger opens the hive and takes the honey, while the Honeyguide feeds on the remaining wax and larvae. The honey badger is otherwise considered a vicous and aggressive predator but surprisingly means no harm to the honeyguide!